The Mountain Feist should be evaluated as a working dog, and exaggerations or faults should be penalized in proportion to how much they interfere with the dogs ability to work. Honorable scars resulting from field work are not to be penalized. The word "feist" is an ancient one referring to a small, often noisy dog. 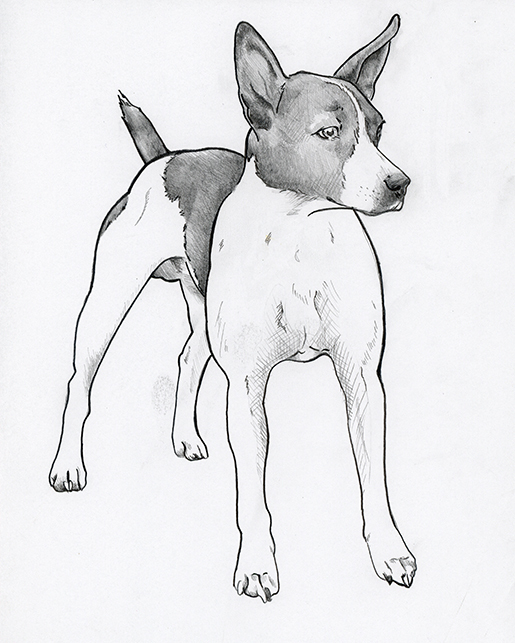 Like the Cur breeds, the Feist breeds were developed in the rural South by breeders who needed low-maintenance dogs to hunt small game and to eliminate vermin, Feist were often the result of crosses between hunting hounds and terriers. Todays Mountain Feist is the result of generations of breeding for performance and is still primarily used to hunt squirrel, although they are also used to hunt raccoon, rabbits and more. 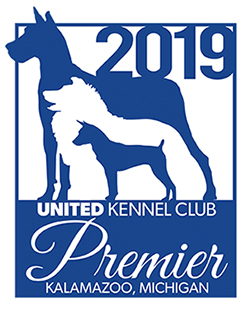 The Mountain Feist was recognized by the United Kennel Club on February 1, 2015. The Mountain Feist is an agile, active, small tree dog. The body is slightly longer than tall. Regardless of the size of the individual dog, the legs must be long enough to allow the dog to move quickly and with agility in rough terrain. The head is blocky, with a broad skull, a moderate stop, and a strong muzzle. The tail is straight, set on as a natural extension of the topline, and may be natural or docked. The coat is short and smooth. Disqualification: Unilateral or bilateral cryptorchid. Mountain Feist hunt using sight, sound and scent, and are extremely alert dogs. On track, they are virtually silent. Disqualification: Viciousness or extreme shyness. The head is proportionate to the size of the body. When viewed from the side, the muzzle is slightly shorter than the skull and joined by a definite stop. The planes of the skull and muzzle are parallel. The skull is flat and broad, tapering slightly toward the muzzle. Cheeks are muscular, but not over-developed. The muzzle is long and sufficiently broad and deep to balance the skull. Lips are tight. Lip pigment matches nose pigment and eye rims. The Mountain Feist has a complete set of strong, white, evenly-spaced teeth meeting in a scissors bite. The nose is black or self-colored. Eyes are brown, ranging from dark to amber. Eye rims match nose pigment. Ears are v-shaped, set at the outside edges of the skull. Ears must be erect, or tipped (erect with just the tips dropping forward), when the dog is alert. Note: Ear carriage may not stabilize until a dog is mature; therefore, dogs under one year of age should not be penalized for variations in ear carriage. Disqualification: Cropped ears. Pendulous ears. Button ears (where the top half of the ear drops forward). The neck is clean, muscular, and of moderate length. The neck gradually widens from the nape and blends smoothly into the shoulders. Shoulders are well laid back. The upper arm is long and forms an apparent 90-degree angle with the shoulder blade. The forelegs are strong, straight, and moderately well boned. The elbows are set close to the body, but able to move freely in action. The pasterns are short, powerful, slightly sloping, and flexible. A properly proportioned Mountain Feist is slightly longer than tall. Chest is moderately wide and deep, with the brisket reaching to the elbow. Ribs are well sprung and extend well back. Back is of moderate length, and level, blending into a muscular, slightly arched loin with slight to moderate tuck-up. The hindquarters are strong and muscular. The bone, angulation, and musculature of the hindquarters are in balance with the forequarters. The stifles are well bent, and the hocks are well let down. 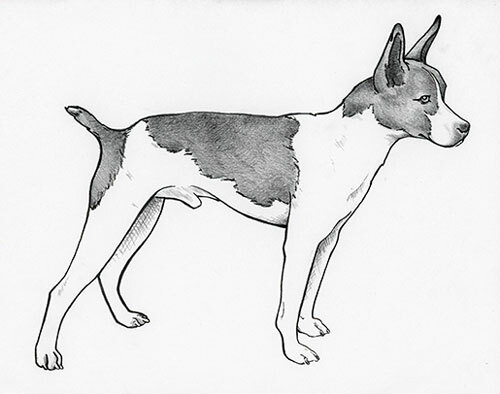 When the dog is standing, the short, strong rear pasterns are perpendicular to the ground, and viewed from the rear, parallel to one another. The feet are small, compact and slightly oval in shape. The two middle toes are slightly longer than the other toes. Toes are well-arched. Front dewclaws may be removed. Removal of rear dewclaws preferred, but not mandatory. The tail is set on at the end of the croup. Docked or natural tails are acceptable. Docking should be between the second and third joint of the tail. The natural tail is thick at the base and tapers toward the tip. When the dog is alert, the tail is carried in an upward curve. When relaxed, the tail may be carried straight out behind the dog. The coat is short, dense, and smooth, with a hair length of approximately one inch or less. Disqualifications: Semi-wire, wire or long coats over more than 50 percent of the body. Mountain Feist may be any color or combination of colors. Height, measured at the withers, must not be less than 12 inches nor greater than 18 inches. Ideal working weight should not be under 12 pounds nor over 30 pounds, and is dependent on the dogs height. The Mountain Feist should always be presented in hard, working condition. Dogs outside the approved height range shall be penalized only to the degree that their size affects their ability to work. Eliminating Faults: Dogs under 12 inches or over 18 inches. Gait is smooth and effortless, with good reach of forequarters. Rear quarters have strong driving power, with hocks fully extending. Viewed from any position, legs turn neither in nor out, nor do feet cross or interfere with each other. As speed increases, feet tend to converge toward centerline of balance. This breed is capable of great bursts of speed when needed. Dogs under 12 inches or over 18 inches. Button ears (where the top half of the ears drops forward). Semi-wire, wire or long coats over more than 50 percent of the body.